WASHINGTON, D.C. – Today, U.S. 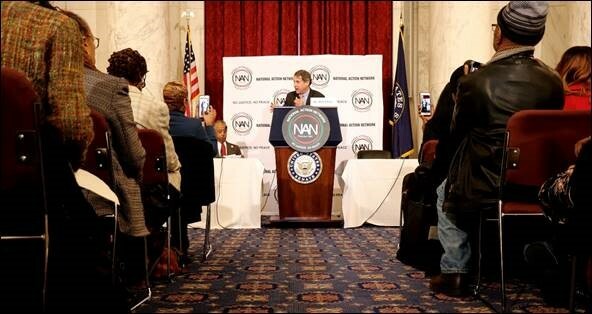 Senator Sherrod Brown (D-OH) delivered remarks at the National Action Network’s Legislative & Policy Conference in Washington, D.C. Thank you to Reverend Sharpton, Ebonie Riley, Kyra Stephenson-Valley, and all the members and chapter leaders. After that conversation, she gave me a book that is a compilation of Dr. King’s speeches on civil rights and the labor movement, called “All Labor has Dignity.” From the late 50s until his death in Memphis, he tried to bring the labor movement and the Civil Rights Movement together. When you love this country, you fight for the people who make it work. You all make that fight every day. And when we talk about workers, we’re talking about all people, whether you punch a clock or swipe a badge, make a salary or earn tips. Whether you’re raising children or caring for an aging parent. Donald Trump with his phony populism has tried to fool people into believing he’s on their side by attacking fellow Americans and demonizing immigrants. He’s purposely pit one group against another to distract from the fact that the Trump White House looks like a retreat for Wall Street. And he’s used the presidency to enrich the same special interests that caused so much hurt in communities around the country. That’s not populism – populists are not racists. Populists are not anti-Semitic. They don’t appeal to some by pushing others down. This is our America: we will never give up the hallowed ground of patriotism to the extremists. One of the most insidious ways to divide Americans is by disenfranchising voters. We’ve seen the attacks on voting all over the country. We saw it in Ohio, where voters were purged from the roles – and the Supreme Court upheld that despicable law. And we know who these despicable laws are aimed at – it’s people of color. Think about that. And think about what we’ve seen in this election. We must make sure every vote is counted in Florida and Georgia. The attempts to discredit counting legitimate votes is a disgrace. President Trump tweeted about “finding” votes in Florida. That kind of talk is dangerous to our democracy. No, we are not going to move on. We’re not moving on until every vote is counted. We cannot have economic justice for all Americans without justice at the ballot box. That’s why all of your work matters. Democrats perhaps don’t talk often enough about our faith, but when I think of the work you do, I think of Matthew 25, a passage many of us learned as children. In Matthew 25, Jesus tells us, “When I was hungry you fed me. When I was thirsty, you gave me drink. When I was a stranger, you welcomed me. What you did for the least of these.” – Wait. Wait a minute. I’ve always had a hard time believing that Jesus would have talked about, “the least of these,” – or that Mohammed or Moses would have said that someone is worth less than someone else – or that Buddha or Gandhi would have judged some people to be more valuable than others. That spirit is so evident in the work you do, whether it’s on voting rights or mentorship programs or legal aid or so many of the other issues you fight for. Thank you for all that you have done – we’re going to continue our fight, together.